I made a couple pizzas for dinner this week. They both turned out pretty good! And we have a whole pizza - some pieces from each - left over for another meal! Here are the toppings for both pizzas. No measurements really, because pizza is just like that. You pile on the toppings until it looks right to you. Spread sauce on crust, sprinkle Parmesan on the Garlic Ranch sauce. Add toppings and cheese. 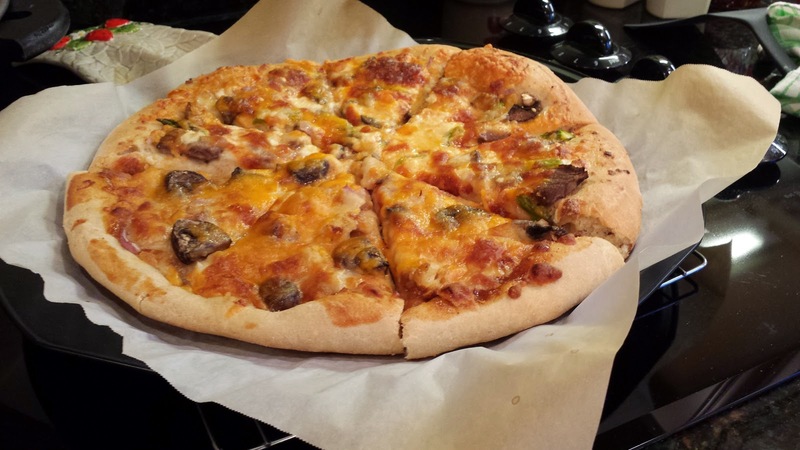 Bake pizzas at 450° F for 15 minutes or until crust is done and cheese is melted and browned. Remove from oven and let sit for at least 5 minutes before cutting. I am still trying to find the perfect Pizza crust recipe or technique or whatever the secret is to that perfect crust. This one wasn't too bad, but there's definitely room for improvement. The toppings, on the other hand, were very yummy!